For my first ever twin blog post I have the honor of being paired up with the Sparkle Queen. This months theme patterns and we were given Anthemion as our pattern. I don't know about you but I had no idea what that pattern was. Thankfully we were also given a website that lists examples of all sorts of patterns.
" 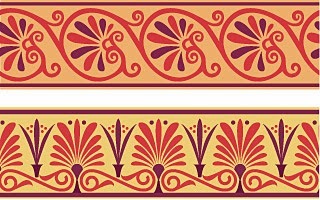 A classical motif based on a stylized honeysuckle plant or a radiating, fan-shaped palm leaf (palmette) commonly found in Greek, Egyptian, Assyrian, and other ancient art." Seeing the examples provides I had a very avant guard feeling and decided I wanted to use a glitzy color for my base. The thought of using one of my stamping plates to recreate this design crossed my mind several times, but I decided to really go for it and try some freehand art. Now let me be the first to say that my free hand skills are severely lacking. But I won't get better if I don't practice right? So here is my version of an anthemion pattern. I used Wet-n-Wild Gold Album from the Fergie collection as my base and free handed 2 pieces of the design with a black striper. At the last minute, I threw in the pink dots for a pop of color. I started out really liking the way this was turning out but got rushed halfway through and I feel that it shows in the finished product. But I'm not letting that get me down too much because I think that nail art is about learning as you go and the journey is half the fun. Also, I knew sitting down to do this that I didn't have the right tools in front of me, and you can't get great results with the wrong tools. I'm not sure if this is a look that I will try and create again. It is a fun looking pattern though. Now let's see The Sparkle Queens version of an Anthemion pattern. Today in my what's in a finish series I take a closer look at the frost and Pearl finishes. A frost finish is a very fine, shimmery polish often having an icy look to it. Predominantly having a metallic look, a typical color balance is more frost than pigment. The big downfall for this finish is it often shows heavy brush strokes. Even a good top coat can have a hard time covering them up. This can tend to make people want to shy away from using them and they are losing popularity. Which is a shame since they usually are really pretty colors. The Pearl finish is very similar to the frost finish except that it has a pearly sheen and a satiny look. This is another finish that seems to have lost popularity because of the brushstrokes and is mainly found in older polishes. Overall I think these finishes have some good qualities to them, but the brush stroke factor has limited my purchasing and use of them. How do you feel about them? Thanks for stopping by and Happy Polishing! Hello there my fellow lacquer lovers. Today I have an indie polish to share with you from LynBDesigns. This one is called Mind Palace and is from her Baker Street Collection. A jelly finished glitter bomb that I fell in love with when I saw the picture in her shop. Mind Palace is described as a "royal purple base with gobs of white, silver, black, purple, and even blue glitters." Shown here I have 2 coats of Mind Palace layered over Sinful Colors Mesmerise with top coat. Mesmerise was the wrong base color to use since it was too dark. I ended up losing a lot of the purple glitters when looking at my nails. Thankfully the camera was able to capture them for you to see. I had to do some slight fishing for glitters to get some of the larger white hex glitters but the smaller glitters came out easily. As you can see I was able to get decent glitter coverage on my nails. I didn't have to do the dab method either which was pleasantly surprising. I have to admit my experience with glitters is pretty limited and I have yet to master the dab method. Even though I used one layer of top coat I still had a tiny amount of texture from the glitters but they all laid nice and flat on the nail. 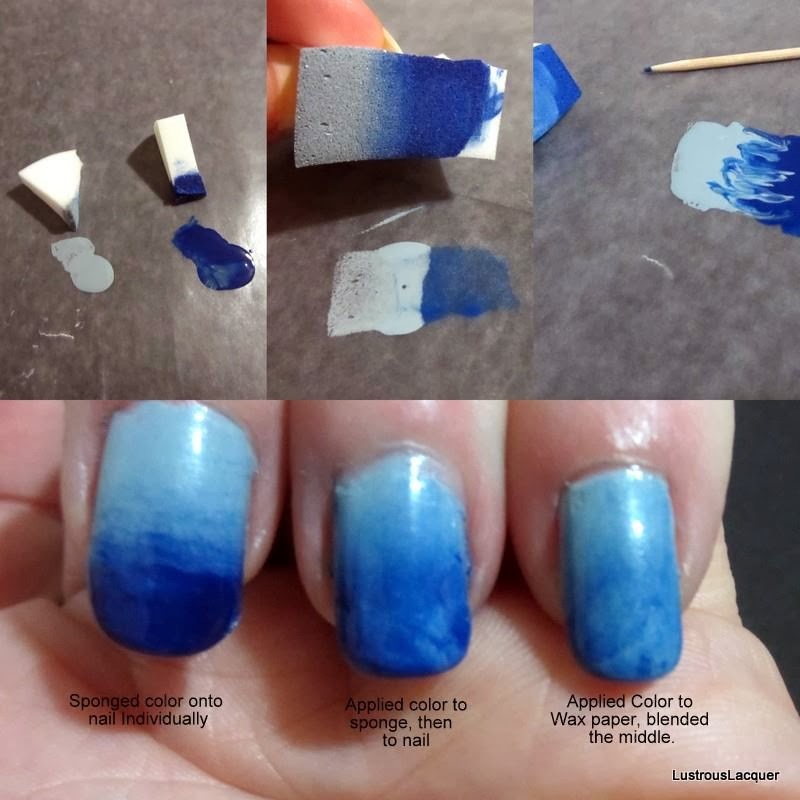 A second layer of top coat would give you a completely smooth finish. Removal was typical of most glitter bomb polishes and required a little extra time compared to a creme polish. But it wasn't a huge PITA to deal with. 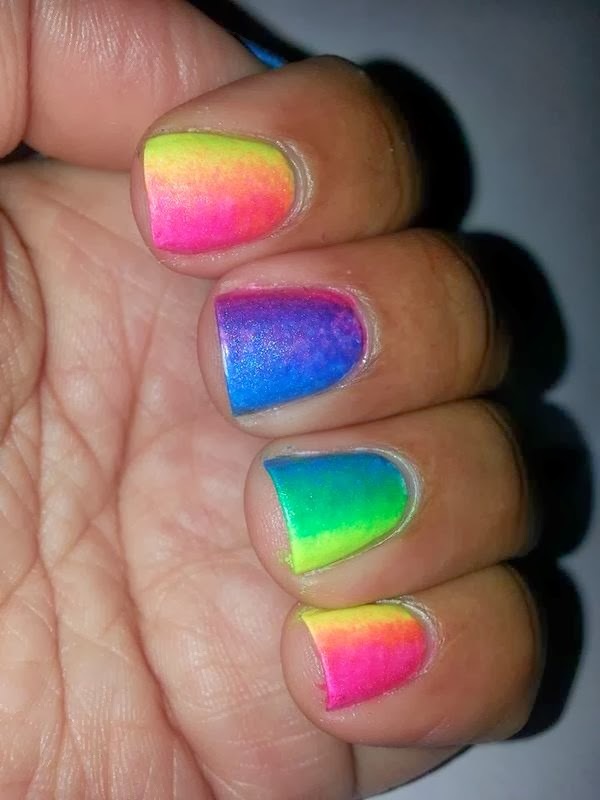 I'd like to wear this polish alone next time so all the jelly goodness can be highly visible and will add a picture to this post so you can see it both ways. As promised I have a picture of Mind Palace all on its own to show you. This is 3 coats without top coat. Hello everyone. It's time for another installment of my what's in a finish series, which also means it's Monday... Well, what better way to chase away those Monday blues than with Neon! Now while I own several neon polishes I have yet to use them for more than a dotticure which I wasn't happy with the results. So a few fellow bloggers were gracious enough to let me share their pictures with you. Please stop over and check out their blogs or pages. But before we get to the pics lets talk a little about neon polishes. Shown here is 3 coats without top coat. 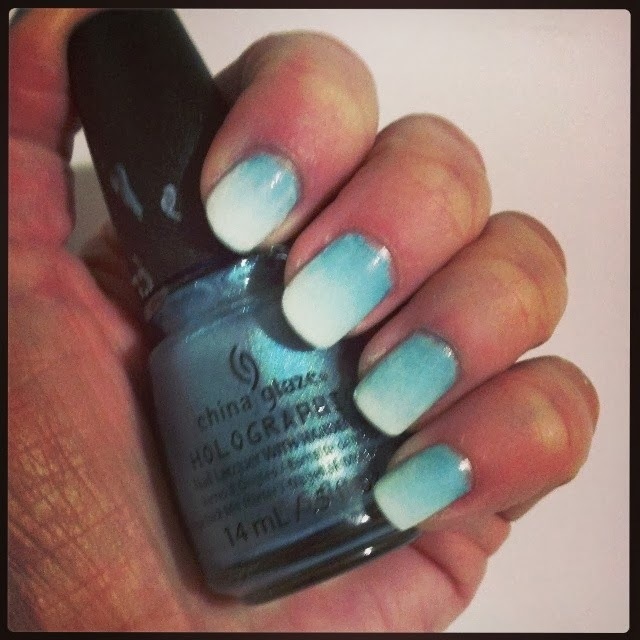 You can follow the link provided to find out more about this specific polish. I'll warn you that there are a lot of photos so you may want your sunglasses handy. Not all neon polishes are quite so in your face bright as shown by XO NOELLE in the next photo. So if your looking for something to ease your way into neon's this collection from LCN might be more your speed. Still considered a neon polish this blue has a sort of muted neon feel to it. Perfect for a pop of color but not too bright at the same time. Neon polishes also make for fun nail art as shown here by Amanda Loves Polish. This is a manicure that I have wanted to do for a while but am holding off until the weather gets a little warmer. It's just too much of a fun manicure to sport during the gloomy days of winter. Although if we get another really cold spell here like a few weeks ago I might just change my mind about that. So what are your thoughts on neon polishes? Are you a wear a full bright manicure kind of person or do you prefer your neon in little bursts? Does the streaky application reputation scare you away or are you up for a challenge? Thanks for stopping by and checking out my post. Id love to get your take on these and as always, Happy Polishing! 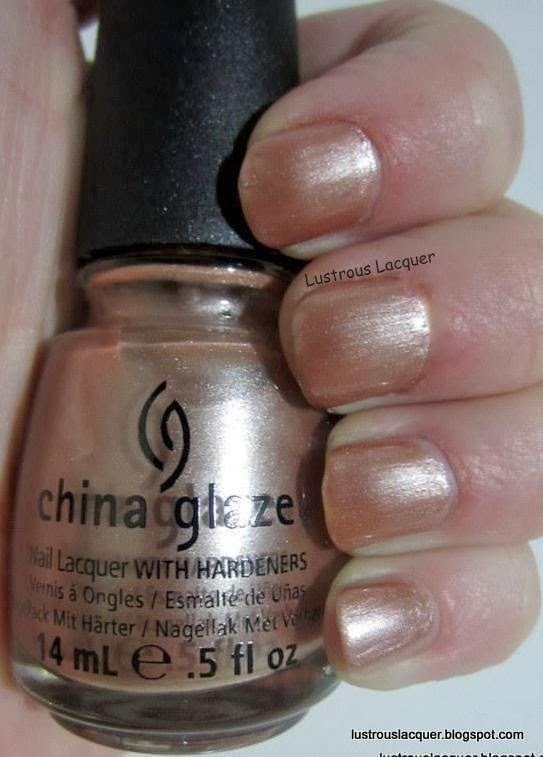 Today's NOTD post is Finger Paints She's a Beaut from the Vintage Glam collection fall 2013. A gold metallic polish with a brownish undertone. To be honest I was drawn to this polish because of the undertones. Most of my golds seem to have more yellow to them giving them a polished brass look whereas this one reminds me of burnished brass. Perfect for that vintage vibe. Shown here I have 2 coats of She's a Beaut without top coat. The application was nice and even. Unlike typical metallic polishes, this one dried to a smooth finish with minimal brushstrokes left behind. The few that my camera captured were hardly noticeable with the naked eye. So what are your thoughts on She's a Beaut? Just your regular old gold metallic or a twist on an old favorite? As always thanks for stopping by an Happy Polishing! Hello there everyone. 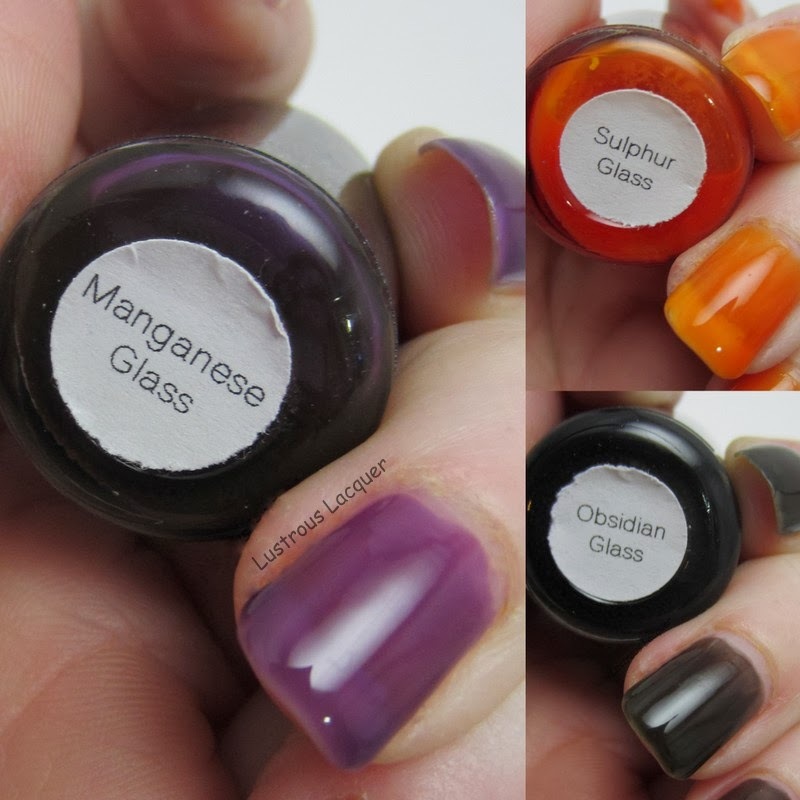 It's time to get back to my nail polish finish series now that all the holiday madness and nail art challenge is over. Today I am going to take a look at the foil finish. 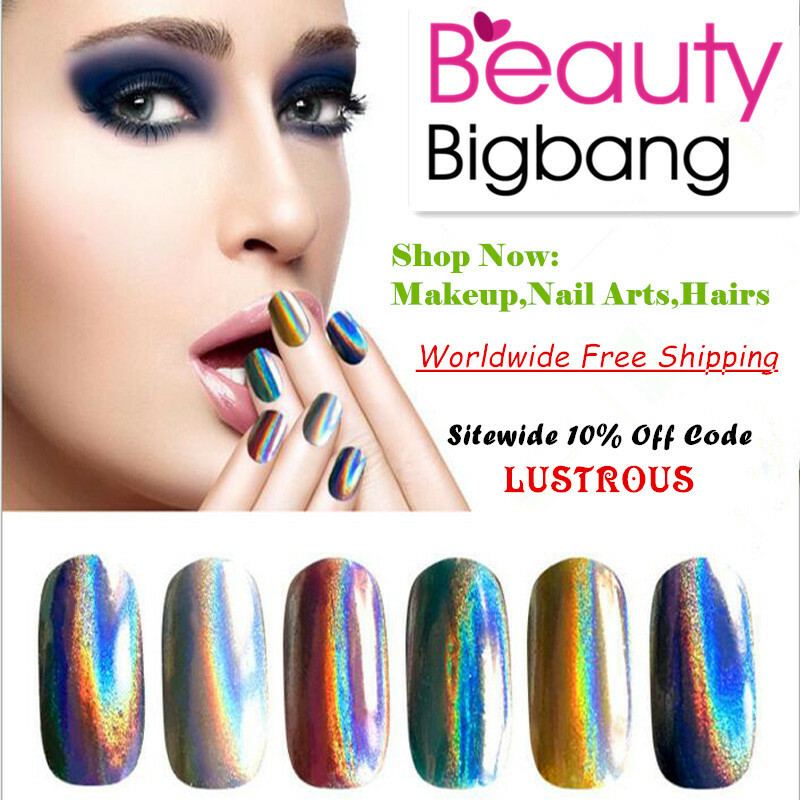 The foil finish nail polish often has a metallic base with very very fine glitters added. It dries to a smooth finish but not quite as smooth as a chrome. This results in a very sparkly finish. Foils are usually compared to metallic finishes but there are significant differences between the two. Metallics typically come in metal colors, copper, gold, silver whereas foils cover the entire spectrum of the rainbow. Giving you a wider variety to choose from. I hope you've enjoyed this post, be sure to check out previous posts in this series and as always Happy polishing! Hi there. 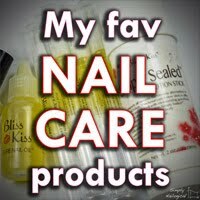 I just have a quick NOTD post for you today. The other night I posted a picture of 3 bottles of polish and asked my Facebook followers to help me pick which one to use. I left the vote open for 20 minutes and ended up with a tie between Zoya Pierre and Polish Addict Nail Color a.k.a PANC Berry Bewitching. So I decided why not get crazy and use both. Ok, maybe not so much get crazy, but lazy as I didn't want to make the final decision myself. These colors ended up going together nicely. In fact, they seem to have the same undertone to them. A muted purple leaning towards mauve. Which in my book lets them fall into the category of Pantone's color for 2014 orchid! I used 2 coats of Pierre and 3 coats of Berry Bewitching to get full opacity. Then I topped everything off with a coat of Simply Quick top coat. As you can see Berry Bewitching is a slightly darker purple than Pierre and is meant to be a glitter topper but works well on its own too. Today's blog post is brought to you by someone very special to me. My daughter who everyone calls my mini-me was given her very own set of nail polish from her grandparents for Christmas. Now if you've been following my FB page for a long time you may remember a few pictures I posted about the mani's she's had me do for her. She has her very own style when it comes to polish and knows specifics on what she wants me to paint. So I decided to let her do a guest post on my blog. Everything coming up will be in her own words and she even painted her nails all on her own this time. I only had to help with clean up on 2 nails. That was a proud mommy moment for this polish lover since she is only 5 yrs. old. This polish looks cute. It's my favorite color. It also looks good with a purple polish like I have on my toes. I applied one coat of polish. My mommy had to help me clean up a little. I like to wear this polish while I drink Chocolate milk. The strawberry scent smelled really good! I guess to a 5-year-old having pretty nails while drinking chocolate milk is pretty important. I think she may be paying more attention to me when I blog that I realized because she remembered to tell me how many coats she used. I love that we can spend time together painting our nails and talking about her day. I hope it's something that we can continue to do as she gets older, even into those "my mom embarrasses me no matter what she does" years. I hope you enjoyed this post. Happy Polishing!